We love guitars, music and music lovers. We are always making best efforts to contribute to the field of music. It would be our great pleasure if you could enjoy music with our guitars and we could make you happy even for just a short while in your life. The workshop staff from across the nation are excessively fond of music. We cut, shape and grind wood and build our favorite instruments. Especially you who love music, we would like you to play our instruments. 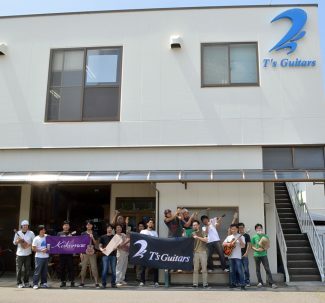 T’s Guitars is in Shiojiri, Nagano Prefecture. The city is almost located in the center of Japan. Shiojiri, surrounded by Japanese Alps and other mountains, is a beautiful place with clean air and clear water streams. We are building each guitar with the greatest care from Shiojiri to the world.